Donated every year I've been here, But it is starting to look like a Red Cross donation push. The Frater have always come through. "A Moment of Laxity Spawns a Forum of Internet Ads..."
Great "thought of the day", there, Rashbold. Meanwhile, I'm sitting here, waiting for the final report! Edited by Augustus b'Raass, 21 August 2016 - 07:56 PM. In the meanwhile... THANK YOU SEMPER! The Etl was a blast! And all of you, Chaos Fratres! Edited by Filkarion, 21 August 2016 - 09:01 PM. Enough is enough. Stop interfering with Captain Semper's Wi-Fi. For some of us, the continuing delay means one less day til the end of the year that we have to bear the Badge of the Oathbreaker... So take as long as you need Semper!! The glass planet begun to crack... Captain Semper looked around him in abject disbelief. - What do you mean daemon? - It does not consume me foul creature of the Warp! He pulled his trusty plasma pistol and pointed it directly to the apparition in front of him. - You know Chaos cannot win, daemon! You know the Emperor's light will do away with the darkness. - But here's where you're wrong Captain. Chaos will win and in fact it's winning now, as we speak! CHAOS HAS WON YET AGAIN! 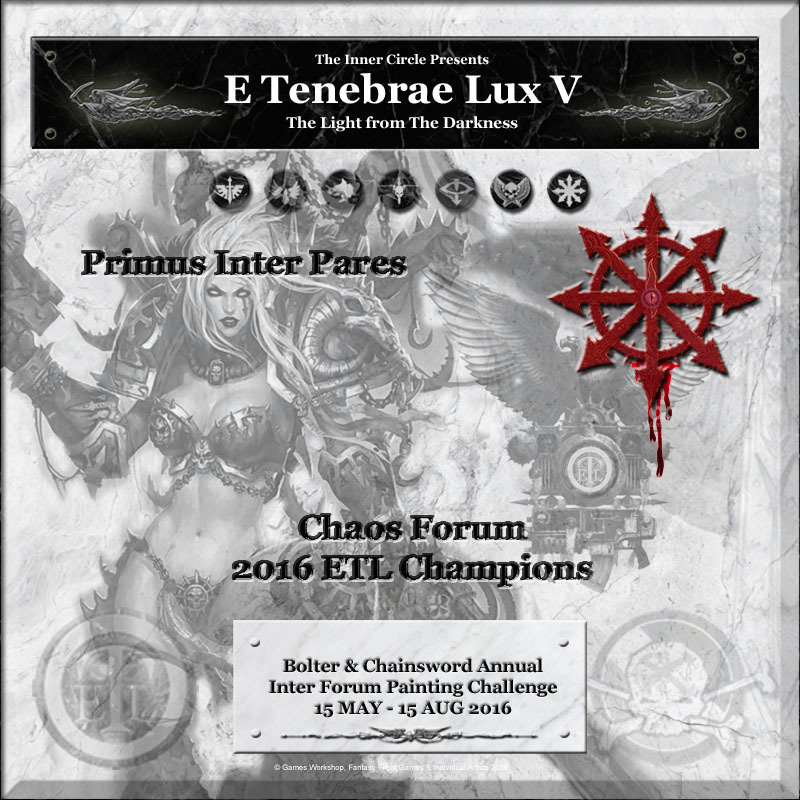 REALM OF CHAOS: E TENEBRAE LUX V CHAMPIONS!!! ETL V is over and what an ETL it was! Huge participation again, the second highest in fact, with 472 participants and the highest completion rate ever which led to the HIGHEST amount of completed points, beating even the legendary ETL III! The biggest event of its kind in the internet just achieved new heights! As usual I would like to congratulate those who completed their vows (or even one vow) and for those who didn’t, well, there is always the next time! So what were the highlights of this year’s event? Well obviously that Chaos managed a third win in a row! This speaks volumes for the enthusiasm and commitment of our Chaos community. Their Strategium thread run 78 pages long, they put their customary satellite event in place and they achieved a scary completion rate for what is the second more populous Faction in the ETL. To further drive the point home, it was the only Faction this year with zero penalty points. Another point to raise is the ongoing growth of the HH fan base. The HH setting is capturing an increasing portion of the B&C frater and this is reflected in the huge following in the ETL with 108 participants this year – the highest among all factions and the highest in the history of the ETL! And not only that but despite the large following their completion rate stood at very high levels in absolute terms. This was a huge channelling of resources, something that must make the HH community really proud! Lastly I would like to point out how things work at the other end of the spectrum, with no enormous vows or huge point-count, but with tons of commitment, enthusiasm and fun: The Blood Angels Faction! These guys despite having the lowest average vow in this year’s ETL of barely 400 points (actually the lowest average vow of all Factions of all ETLs) and a participation level that was significantly lower than last year’s spike (but still materially higher than the previous years) managed the highest completion rate in this year’s ETL and the second highest ever (the highest was achieved by the HH faction in ETL II when it numbered just 16 participants). Again this year the conduct of all participants was exemplary despite the competitive nature of the event. People were always helpful, polite and constructive, as they tried to explain techniques, share tips, help newer participants navigate through the ETL mechanics and of course cheer and encourage their fellow players in new heights of achievement. 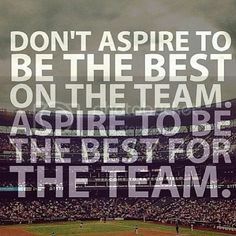 This is what aligns the ETL with the mission statement of the B&C and that's how it will continue going forward! Furthermore, the “Spirit of the ETL” starts to seep through and gradually people willingly align with it – sometimes zealously so! As you can see there was a sustained strong result every week with the exception of Week 5 (the one immediately after the closing to new participants) which in itself was not that bad. But from Week 6 onwards people became active again maintaining pace week after week. Even Week 9, traditionally a very slow week, did very well – lower than the one preceding and succeeding it but still quite strong. And then Week 11 happened. Don’t know what made the entire community to spring into action, but whatever it was, it worked. Then Week 12 maintained the high completions trend and Week 13? Oh boy… The strongest Week 13 of all time with more that 150k points! This is a record I doubt we will ever beat! I think the main takeaway from this ETL is that during the dreaded period of deep summer, Weeks 8-10, the production did not wane and as such the final result was an unprecedented 393,548 points (before penalties) the highest score ever in the history of the ETL, beating even the legendary ETL III levels by 566 points and last year’s ETL (the one with the highest participation ever) by more 44 thousand points! Also the penalty points were significantly lower vs. last year and closer to the (admittedly very low) ETL III levels. ALL GLORY TO REALM OF CHAOS! ETL CHAMPIONS FOR A THIRD TIME IN A ROW! The Codex Faction beat last year’s performance by more than 11k points from roughly the same amount of participants highlighting the Faction’s commitment and tenacity! Tenacity that was further underlined by the very respectable 47% re-vowing rate (points of subsequent vows over points of first vows) and a fairly high completion rate among those… I guess the below 60% completion rate among first vows was the main reason the Codex was kept back… That and mid-summer blues! The Blood Angels were the most committed Faction of the ETL. Plain and simple. With an astounding completion rate of 86.5%(!) and the second-best re-vowing rate of 65%. From Week 4 they surpassed the average completion rate and they never looked back. Furthermore, the constant interaction in the Strategium, that run for 55 pages, worked wonders for the motivation of the BA team as they completed vow after vow. So congratulations are in order here. The BAs made a heroic effort and was undoubtedly a huge moral victory them. Be that as it may, the BAs managed a spectacular feat, achieving the highest completion rate this year and the second highest among all factions in the entire ETL history. As a result, they beat their last year’s performance and this says a lot as last year the BAs had record participation of 83! Congratulations for an exemplary performance and one of the liveliest and fun Strategiums of ETL V! Now what will ETL VI bring? The Dark Angels have won the second ETL with participation levels not very dissimilar to this year (63 vs. 57) and as such we cannot attribute this performance to lack of interest. I think it’s the lack of motivation that maybe stems from fatigue after all these years being a prominent player. Looking at the week-by-week evolution we come to realise that apart from Week 7 and to a lesser extend Week 5 the performance was really, really subdued with only a few committed participants reported in their completions. Generally speaking, the Strategium was under-utilised a just 18 pages, and this is something that probably affected morale and enthusiasm… Week 13 (the last week) produced more than half of all the DAs completions, the only Faction in this year’s ETL to have such an uneven result. A special mention should go to the valiant Dark Angels who saw this through, carrying the honour of the Lion on their shoulders. Going forward we need to re-build the drive of our forum on the painting front and reclaim a leading position in the near future. The Lion will accept nothing less! The Space Wolves surprised everyone this year with their highest ever participation levels, highest ever pledged points, highest ever completions and highest ever completion rate! And when I say the “highest ever” I don’t mean just a bit higher, I’m talking about more than double numbers here! Get this: Their completions were more than both previous ETLs put together! And in true SW tradition, their average vow was the highest in the ETL, beating Chaos and HH! Not only that, but again in true SW spirit they have 5 Heroes among their ranks, more than any other Loyalist Faction! However, it was a bumpy road to the Third position (which they have never come close since the first ETL) with two weeks (Week 5 and Week 7) producing no completions at all. At that point I was really concerned that the initial enthusiasm would wane but boy was I wrong! From Week 11 onwards, the SWs charged forward delivering completion upon completion and of course Week 13 sealed their position in the third place with a completion rate of 79% (above the ETL average). Interestingly they also suffered the second highest penalty or 1,918 points… And still they made Third place. I would be remiss if I was not to mention the valiant efforts of the new Forum Champion, dantay_xv to bring the Strategium together and inspire, assist and motivate his fellow SWs to achieve a very rewarding final result. The Forces of the Imperium was the Faction that suffered the most compared to last year. Admittedly last year saw a spike in terms of participation levels reaching 86 but unfortunately, this year, only 44 joined. Of course, looking back, this is in line with the Faction’s ETL III performance and way above ETL II and 4x the ETL I levels. So I guess the question is not what happened this year but what happened last year to cause such a spike. And the answer seems simple: The AdMech Codices! The new Mechanicum Codices created a lot of momentum for the Faction last year but unfortunately it did not last. The AdMech Forum had only 8 participants this year compared to 36 last year; this is not something it could recover from. Still the quality of work that came out of the AdMech forum is top notch, highlighting the commitment of the few dedicated Mechanicum Adepts. But it’s not all AdMech, the Imperial Guard also had fewer participants vs. last year (21 vs. 31). Further to that the relatively low first-vow completion rate (40%) had an adverse impact on the excellent performance of those who did complete and moved on to complete second and subsequent vows and did so at 100% completion rate! The SoBs had high participation with 10 participants but again, the low first-vow completion rate had an adverse effect. Still all the second and subsequent vows were completed to 100% completion rate thus avoiding unnecessary penalties. I have to say that, every year, the SoBs effort has an aura of heroism unlike any other faction given the limited support they’re getting from GW and their all-metal miniature range! A miniature range mind you that still stands its ground in today’s tables, a testament to the quality of those original sculpts! A special mention should go to Inquisition with the fantastic entry by Hyperion who saved the Faction’s honour with at least one completion and a fantastic retro-futuristic approach on the pre-Codex Deathwatch! 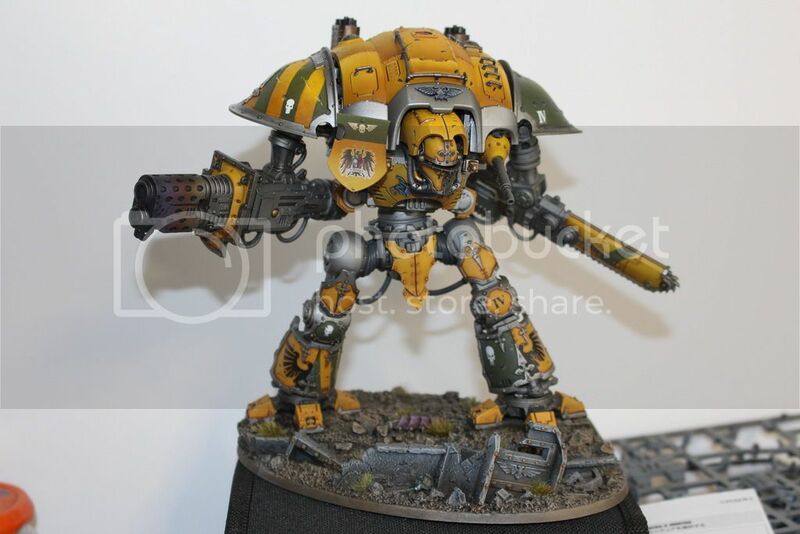 Lastly the Grey Knights with two entries also carried the honour of the Faction – despite a last minute unfortunate development. The IFOR will be further supported next year by the newly arrived Codex Deathwatch so hopefully things will improve! Chaos is the ETL Champion for the third time in a row. This is a magnificent feat especially given rise of the HH popularity and speaks volumes for the community feeling of the Chaos Faction. With 81 participants this was the Faction’s highest participation levels of all time. And despite the high participation, the completion rate exceeded 85% - the third highest of all time among all forums and the second highest this year, beaten only by the BAs and then by only one percentage point! And this is even more meaningful when the total amount of points pledged was north of 130,000 and with an average vow of 835 points – second only to the SWs 867 points. How was this achieved? Well apart from a small respite in Week 5 the Chaos team managed to maintain pace throughout the difficult mid-period of the event and when we hit Week 11 they took off delivering huge amounts of completions in Weeks 11,12 and of course 13! The result was a winning combination of high points in absolute terms coupled with high completion rate. This is just unbeatable. But they did not stop there! They utilised their Strategium thread to the full, making it a 76-page behemoth and to top it all they continued with their customary by now, satellite event that added to their motivation, fun and sense of team effort! I think it’s no coincidence that the only two “Martyrs” of the event (and the first ever since the 3k limit per vow was introduced) came from this faction. Congratulations! The Horus Heresy Faction has gone from strength to strength over the years, as interest for the setting increased exponentially. The AoD forum is among the busiest in the B&C and enthusiasm is the order of the day. But ETL mechanics aside, what came out of the HH Strategium was a treat for the eyes! For one thing, the Faction Champion completed not one but TWO Warlord Titans! Other Titans and other Super Heavies were also pledged, all painted to a top-notch standard. But it was not only the big units that were spectacular. Small units and infantry were just as impressive and they came in volumes! The HH Faction continued it long-standing tradition of painting excellence and they should all be rightly proud! Edited by Captain Semper, 11 September 2016 - 06:19 PM. The Realm of Chaos is the Primus Inter Pares a third year running! This is a hat trick and a record almost impossible to beat! The Badge of the Hero: This goes to all who have successfully completed all of their vows and at least one vow worth the maximum of 3,000pts. demonl for painting up not one but two Warlord Titans! And he didn’t stop there. He went on to paint a Knight and infantry too. WarriorFish for his Knight with LED eyes! The ETL Collegia Titanicus: This is a new ETL Badge of excellence to reward those committed enough to complete at least one Titan during the ETL. 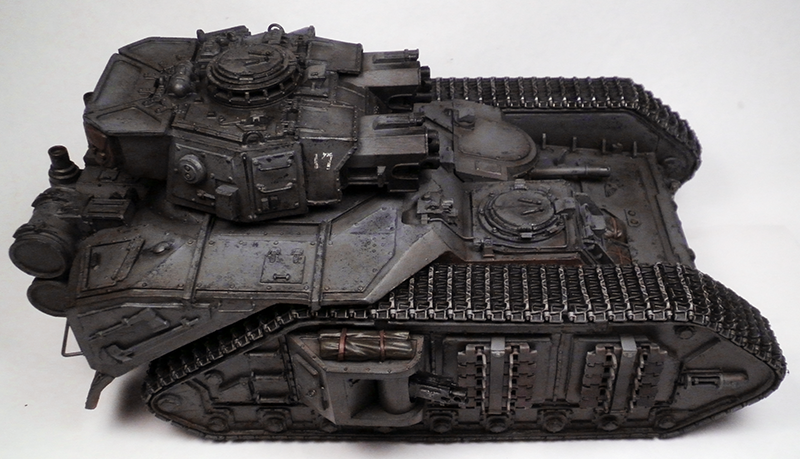 The ETL Collegia Titanicus will be expanded further to award badges depending on the type of Titan each participant completed and will create specific badges for previous years as well... In the mean time, all those who completed a Titan this year but also in the past, feel free to wear it. If your name is not in the list below/ please send me a link of your ETL post with the completed Titan in it and I will happily add it below. Furthermore, we will try to produce Collegia Titanicus badges corresponding to each specific ETL and with the specific Titan type. Until then please use the badge below. And if I have missed any, let me know an I'll add it to the list. Well, ETL V – The Shadow Guard Edition is over. Half a decade of ETL and it still goes strong! With 470 participants and the most points completed ever, I can say this was arguably the most successful ETL of all. As usually, the conduct of the frater during the event was exemplary and in line with the best traditions of the B&C. On the other end of the spectrum, this year the Space Wolves (not least because of the new forum’s Champion’s efforts) came together in what was a show of force that ticked all the boxes in SWs ETL characteristics. Slow start – explosive end, large average vow (in fact the largest of ETL) and loads of Heroes to boot. 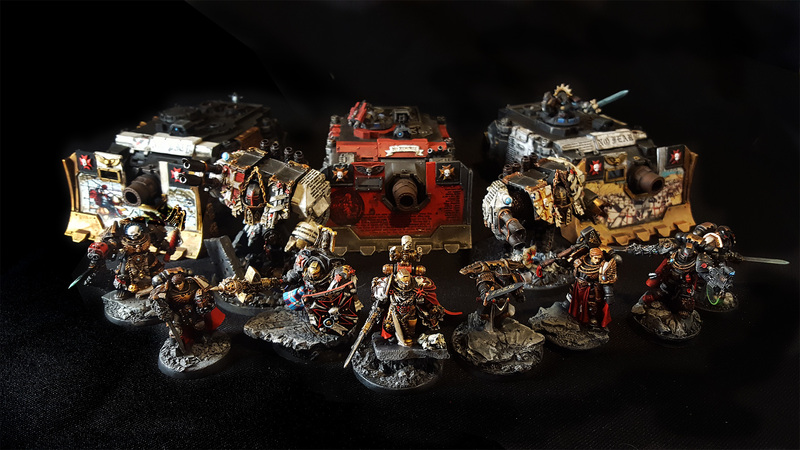 And on top of that their participation rose to an unprecedented 51 – putting them for the first time at par with the BAs, DAs and even the Codex. And the rest, as they say, is history. Now my beloved DAs…. The valiant efforts of those who completed their vows shined through as a beacon of hope but for a Faction that has become Primus Inter Pares this was a very lukewarm performance. I sure hope that the DAs will get back to full strength again next year and will be challenging the top position again. What I need to think about now is the future of the event. Another issue to address is balance. The ETL was never supposed to be this super balanced event to begin with especially as the interest of the frater is not proportionally divided among the ETL Factions. It was supposed to be more like light-hearted fun with a competitive edge. Over the years a number of rules were introduced such as the points’ limit and completion rate adjustment to keep things a bit more balanced without losing sight of the core ideas of the ETL. Still there seem to be further room to improve. HH in particular is extremely popular and it increasingly feels like an entire setting vs. individual 40k Codices rather than the Codex vs. Codex that was the initial inspiration of the event. At the other end of the spectrum, participation levels in the IFOR are materially lower and it comprises many diverse Codices and (perhaps more importantly) Strategiums. There are other things as well, and all will be considered, taking into account not only balance but also the ETL mechanics and practical application... One thing is for sure, ETL VI will see some important differences! Before I close I'd like to thank yet again the Admins (Kurgan and Brother Tyler) for allowing the ETL to run for a fifth year in a row! I would also like to thank the Supreme Grand Master of the Inner Circle The Shadow Guard for giving so much of his time to shape the imagery of the ETL! This fifth ETL is dedicated to him as a token of appreciation and gratitude! I would also like to thank all the Frater and Mods who put an extra effort to create an environment of friendly rivalry - too many to list individually and missing one would be too unfair! These are the frater that rose to the challenge to lead the ETL effort in their respective forums and with wondrous results! Looking ahead, there are the usual events like the Call of Chaos and the Loyalty and Treachery and who knows what else... And of course a refreshed ETL VI will be again with us next May! Edited by Captain Semper, 11 September 2016 - 06:30 PM. Thank you for all of your diligence and hard work, Captain Semper. Edited by Rashbold, 22 August 2016 - 04:23 AM. Thank you Captain for the event, and my apologies for letting down my forum. Awesome work Captain Semper! And awesome work fellow traitorous scum! Also, it might be a while, but I will eventually do model counts for this year. Congratulations to my brothers of the Realms of Chaos faction for once again emerging victorious in this year's E Tenebrae Lux. Congratulations to those of the Horus Heresy for incredible work in the event, I'll be joining you all next year. And congratulations for everyone else who participated in the event. I didn't follow any of the other strategiums or the work that went on in them, but I'm sure everything was awesome. As for me, I will bear my badge of the Oathbreaker with dignity. I was the first to vow in my forum (possibly one of the first to vow in the entire event) and I was really hyped at the start of the event. By failing my vow, I have dishonored myself and my faction, and I shall bear the Oathbreaker's sigil until I consider myself atoned for my failure. Great write up Captain. Many thanks for another enjoyable and productive event. Great event Captain Semper. It was enjoyable and my pile of plastics thanks you. Congrats Chaos! It's an impressive victory. And congrats to the Wolves for beating their rivals. Top effort everyone, and a heartfelt thank you to the good Captain for making sense of the madness! Thank you, Semper, and congrats to Chaos. I know everyone said it repeatedly but again Thank you so much for all the hard work you done for the ETL and us Captain Semper. And a Big congratulations to the Chaos Team! Well done everyone, especially Chaos (woo hoo!). Thanks Captain Semper for another enjoyable ETL experience! Thank you again, Caotain Semper, for again running the best and biggest painting event in the world. Also, congratsulations are in order to everyone who completed their vows, contributed to the fantastic spirit of respectful and friendly rivalry, and especially to the Space Wolves who came in third! I hadn't expected that, and I think it is great. In addition: kudo's to the Blood Angels for their fantastic spirit and commitment - a shame not more frater joined your ranks, otherwise you would have surely topped the ETL. Also thanks to the Horus Heresy for giving Chaos the drive to push just a little further this year, and to Codex for the last minute scare! Congrats to all and see you all in a later event!! Thank you so much Captain Semper for a fun event. We came into this with around 50% of new starts and my experience from my first ETL was that I felt woefully underprepared. 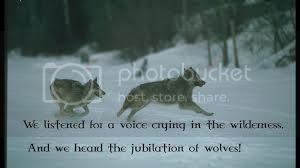 So this year, we as Wolves decided to remedy that issue. We did our best to try and make the Claws welcome and to help prepare them for what was ahead. We also realised that we had a number of veterans who may have been in a similar situation to the Claws, so it was important to ket them know that they are jusst as important too. We also tried to inject some team work along with the fun element which is part & parcel of the ETL. It was not down to one person, but it was a team effort and there were quite a few working behind the scenes to ensure things went smoother than previous years. We often rely so much on our mods, often without realising it. and it is a big ask for us to expect them to hold each forum together in the ETL and run the forums etc. They are here to enjoy themselves too. A forum does not win because of one individual. A forum wins when it pulls together as one. 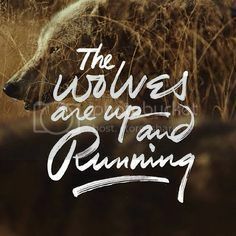 So as a challenge for next year, use the Wolves as an example. Volunteer to help out, work alongside your mods, you see something which you think is not right or needs improving, do not leave it to the mods. Step up and with mod permission, help out. Put a team together who can act as a support network and nurture your Blood Claws. Edited by dantay_xv, 22 August 2016 - 07:13 AM. Thankyou Captain Semper for another awesome event and thankyou to my fellow Frater across the board for being awesome people! Remember as well: if the ETL got you to put paint on a model, then regardless of Faction you're winning at life!